Questions about our yoga center? What class to take? Where to park? What does bhakti yoga mean? 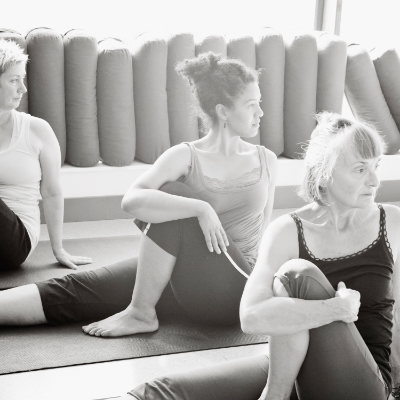 Looking for a change, a new yoga center, or a different kind of class? 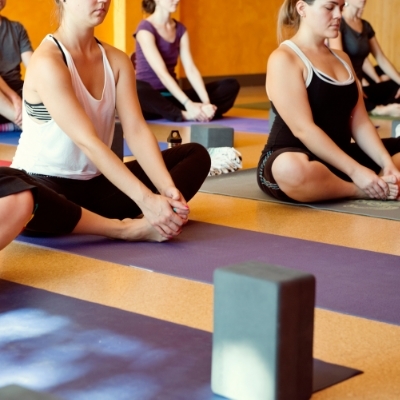 There's dozens of yoga centers in town to choose from, why choose us? Because you are a thinking, feeling, conscious person that is seeking like-minded company. Because you are drawn to the unpretentious and unconditionally welcoming feeling you get from us. Because we are interested in people just like you who are seeking a more nuanced, intelligent kind of yoga practice. Because you have heard that we care deeply for each student, know you by name, and encourage small classes so that everyone is seen, heard, and understood. Because you are a brand-new beginner, and we LOVE teaching beginners. Because now is the time for yoga. What's your address? We are located at 2500 SE 26th Ave at the corner of SE Division St.
Do you have classes for brand-new beginners? What class should I take? Yoga is for everyone, especially beginners. Please click here to read more about being new to yoga and new to The Bhaktishop. We have a whole page dedicated to you. Do you have a special for first-timers? Yes! Your first time to The Bhaktishop, you can take advantage of our 30 days for $30 Intro Special, which gives you unlimited classes and includes free mat rental. Can I just take one class as a drop-in? Yes you can. Our drop-in classes are always available, no membership required. Though we do suggest you check out a class card purchase, or one of our Tiered Passports, which always save you money. Do you have a way that I can practice with you at home? Yes! We have a beautiful online yoga class resource that brings yoga to your house or with you on the road for just $3 per class or for a monthly subscription of $15/mo, or a full year for the discounted rate of $150! 100+ classes updated monthly, all levels, and tons of great instruction. Is there music in class? Many of our teachers begin and end class with chanting using a traditional instrument called a harmonium. Chanting calms the mind, organizes the nervous system, and creates a lovely vibrational container for the class. You can participate, or just listen and enjoy the sounds. Also, many of our teachers play music in the background of their asana classes. It is never loud or oppressive, and often acts as a nice backdrop for the feeling of the class. There are a few teachers that do not offer music in their classes as well, so if this is a concern or interest, do get in touch with us and ask. Should I sign up ahead of time for classes or workshops online? How? It is always a good idea to register in advance for the workshop, retreat, or series you are interested in taking, so that we can plan on your attendance. Some events require a minimum number of students to run, and so its vital that we know you are coming! You can register online here to avoid waiting in line at check-in! What if I'm late to class? We lock the door during class, which means right at the start of the scheduled time of class. Sometimes due to traffic or trains or lateness this will mean that you will be locked out, and for that, we are terribly sorry. We know the effort it takes to come to yoga, and though this is unavoidable, we are also sorry for your inconvenience. Can I bring my child to class? For everyone's safety and comfort, children must be over 14 years old and accompanied by a parent to participate in yoga classes. Once your child turns 16 (and has attended class at least one time with you and all is well,) they may participate in classes on their own, as long as we have a parental permission slip and a waiver signed by you. We are sorry that we cannot allow your child to remain unaccompanied in the lobby or playing in the corner of the classroom while you are in class. We regret that we do not have the capacity for childcare at this time. Is your studio heated? We do not heat the studio beyond a normal comfortable temperature. Yoga practice is safest and most comfortable when there are no extremes, especially in the external environment. This is also why we do not have a need for showers. Are there changing rooms, a shower, lockers? We do have a changing room, but no showers (see above!) And since the door is locked during all classes, we also have no need for lockers. What should I wear? Dressing comfortably in clothing that breathes well and fits you well is best, and it does not have to be fancy (or even match, for that matter.) Lots of folks wear shorts and tee shirts, pajama bottoms, sweatpants, leggings...whatever you feel good moving around in suits us just fine. You will not need a towel, either, unless you naturally sweat easily. Do I need a mat? Yes. Most people prefer to use a mat, though we have a nice soft cork floor here, and some folks practice right on the cork. We rent beautiful Manduka Pro mats for $1 each (though free if you ride your bike or sign up for any of our Tiered Passports) and you can buy mat rental cards in packs to save the need for having cash with you every time. You can also rent your own mat storage space for $10/mo if you don't like hauling your mat to class every time you come in. Just ask! If I have an injury or other limitation, how should I proceed? If your illness or injury is severe, please do get permission in writing from your physician that you are ready for yoga, and consider a private lesson first, before jumping into group classes. We recommend doing anything movement-related that does not exacerbate your condition. Get in touch with us about your issues at family@thebhaktishop.com and we will help direct you to the proper class or teacher for a private class, so that you are sure to let yoga help you heal rather than hurt you further. We offer specific Yoga Therapy series classes taught by qualified instructors trained in a variety of therapy fields for injured or mobility-impaired bodies, so do look for those on the schedule as well. What if I am pregnant? Lucky you! Congratulations! We have three Prenatal Yoga classes each week, and a Mama and Baby Class (for later on) once a week. You are also most welcome at regularly scheduled classes if you have some prior yoga experience, but please do inform the teacher of your exciting news so he or she can assist you if necessary. Many students come to both regular classes and prenatal classes, so please do not be shy about that. All pregnant students are welcome in these classes, including transgender people. Can men come to *Mama & Baby Yoga? This class is for people that identify as women, or that have uteruses and have birthed babies. Although we use the term *mamas* as shorthand for those with uteruses who have birthed or adopted babies, please know that we support all our transgender and non-binary mamas/baby-birthing folks in this class. That means if you are a trandgender man that has birthed a baby, or identify as non-binary, you are most welcome. Can my child/teen come to class with me, or sit in the lobby while I practice? Sadly our insurance does not allow for unattended children in the lobby, nor does it allow children under 14 to attend classes. If your awesome, well-behaved, 14 or older teen wants to accompany you to class they certainly may, provided you fill out a waiver for them ahead of time, and they are able to stay engaged for the whole 60 or 90 minutes of class. Is yoga a spiritual or religious practice? Yes, but that depends on whether you are a religious or spiritual person. If you are, then the practices we offer at The Bhaktishop should help strengthen your faith and devotion to the divine, regardless of what faith tradition you honor. If you’re not religious, neither must your yoga practice be. There is a very heated international debate going on about this question, but we feel it is largely political theater. Yoga indeed originated from spiritual India, which is often called the mother of religion, and we honor those roots here with the philosophical teachings of bhakti. We also honor all traditions, so that no one is marginalized or made to feel excluded from the practice of yoga. Our group classes are intended to create an opportunity for everyone’s intentions for practice, so whether you’re here to ease your lower back pain or to connect with divinity or somewhere in between, we simply want to give you the tools to take you where you’re looking to go while staying as true as we can to the source of the teachings. More on this? Email Lisa Mae at weloveyou@thebhaktishop.com with questions. What is bhakti? Thanks for asking! Bhakti yoga is one of the three main paths to transcendence, and is often translated as the path of love, devotion and service to the divine. How each person meets God is very personal, and the main practices of bhakti yoga are hearing, remembering and chanting. They are so easy, anyone of any eligibility or place in life can practice them! As we try here at The Bhaktishop to bridge the separate paths of yoga and bhakti, we honor the traditions and lineages and practices that bhakti teaches. Will we discuss this in public yoga asana classes? Generally not, as there are so many paths to practice, God, and source and we never want to assume that anyone shares our faith. Not all teachers here share belief in this path to transcendence, either, though each teacher here holds a unique relationship to their own inner spiritual lives. We do offer a yearly Philosophy Immersion course for any seeker to come and learn about the paths of yoga, and particularly bhakti, and you can also talk with Lisa Mae or Monicka at any time about these practices. Our commitment to service to divinity here deeply involves service to humanity in the form of karma yoga, and we strive to do that work every day. Can I sign up for unlimited yoga? Yes you can, and if you take 1, 2, or 3 classes a week or more, you DEFINITELY should! We have something called Tiered Passports for $54, $79 and $99 per month on Auto-draft, all with all kinds of perks from discounts on retail and workshops to free guest passes and free mat storage. With minimum commitment this is the best deal you can get for those of you that practice a lot, or that want to really deeply invest in practicing more. We want yoga to be accessible and affordable to everyone. Click here to learn more! What if I am experiencing financial inequity and I am on a budget that doesn't include yoga? 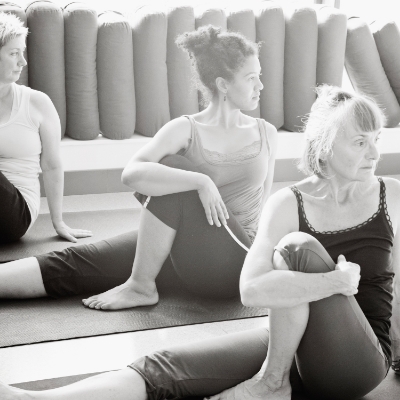 We have several options for you, since we believe that yoga should be accessible to everyone. Four days a week, M-Th at 4pm, we offer a class that is just $8, and on Fridays at 4pm, class is by donation. We have Foundations 1, a Yoga 1/2 class, and Yoga 2 classes at this price each day. We also offer Equity Pricing for those impacted by inequity and barriers to healthcare and wellness services, which disproportionately affect people of color. Please look into it for more information. We also offer a very affordable Online Class Resource, so you can practice anywhere! Where do I park? There is ample free parking on the streets all around The Bhaktishop. Take heed of the No Parking signs on SE Division, however. They will absolutely tow your car if you park there during those hours. What is the mantra printed on the wall? It is a verse from the Bhagavad Gita, chapter 9, verse 26. It says, "A leaf, a flower, a fruit, water; whatever one offers to me with devotion and love, I accept." Every moment of our lives can be a sacred, holy offering if properly oriented. We have this writ large so that we may be reminded of it each and every time we step onto the mat and bow to our source and to the source of yoga. Still can't find the answer to your question? Please do send us an email here at family@thebhaktishop.com, and we will help you at our first opportunity.